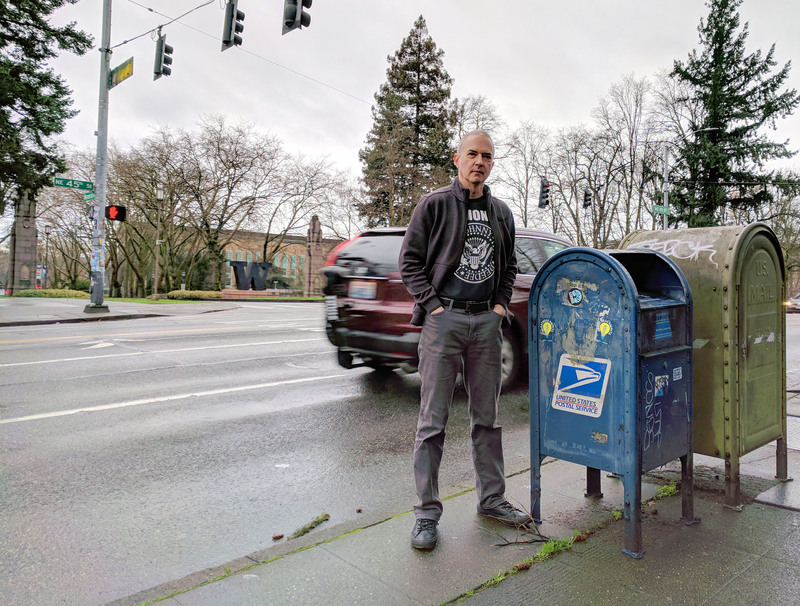 Mailboxes of Seattle – One-by-one, I posed with every publicly accessible blue mailbox in Seattle. This is easily the most meaningless thing I've ever done. 346) And just like that, it’s over. 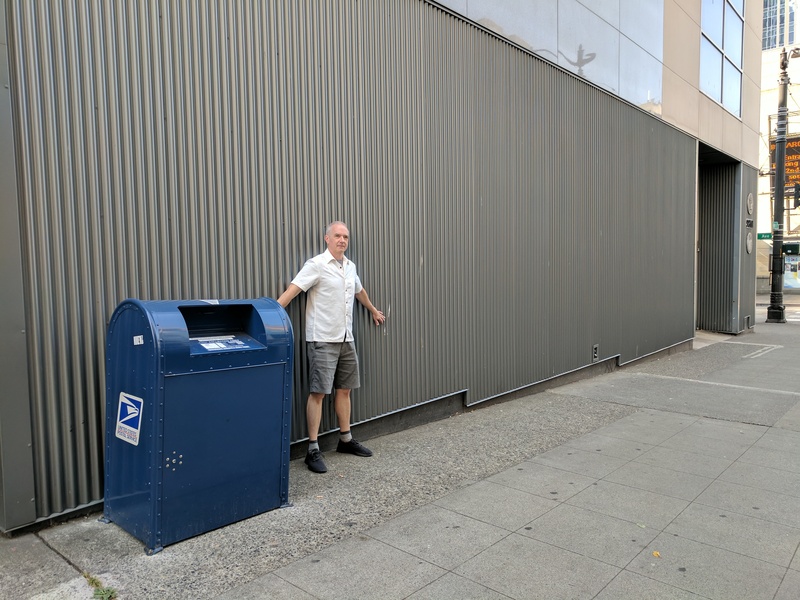 Three hundred and forty-six days ago I started posting one mailbox selfie a day and somehow kept it up until I had grabbed every single one in Seattle. For the final box, I put out the call for people to join me, and I had a wonderful turnout… although the dogs seem a bit bored. The answer to the common question of what’s next is quite simple: nothing. No, I’m not going to do utility poles. Or fire hydrants. Or stop signs. I do, however, encourage other people to tackle those very important projects. 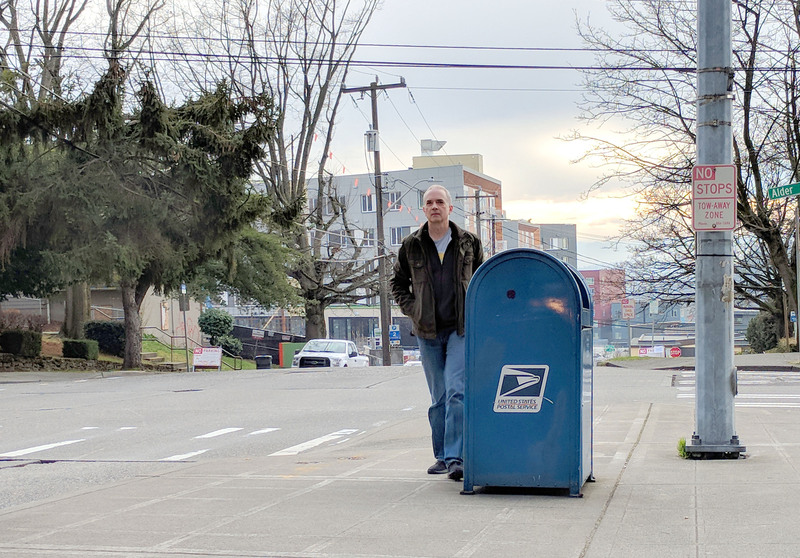 Thank you for following along and please, be nice to your neighborhood mailbox. It leads a difficult life. 345) For the penultimate photo in this looooong project, I am featuring a very rare type of box, one that was moved from one location to another. 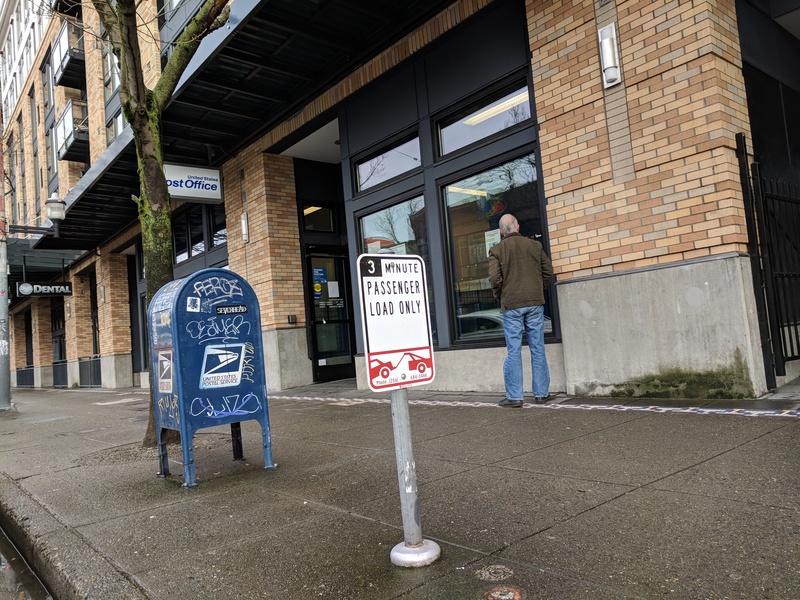 Fellow Seattleites might remember the old post office on Broadway, the one that always looked so run-down that it just didn’t seem like a good idea to drop any mail there. Well, that post office moved a few blocks north to a lovely new location and they brought their box with them. Normally, boxes are not known for embracing change like this, but in this case I think it went over quite well. And that’s it, people. 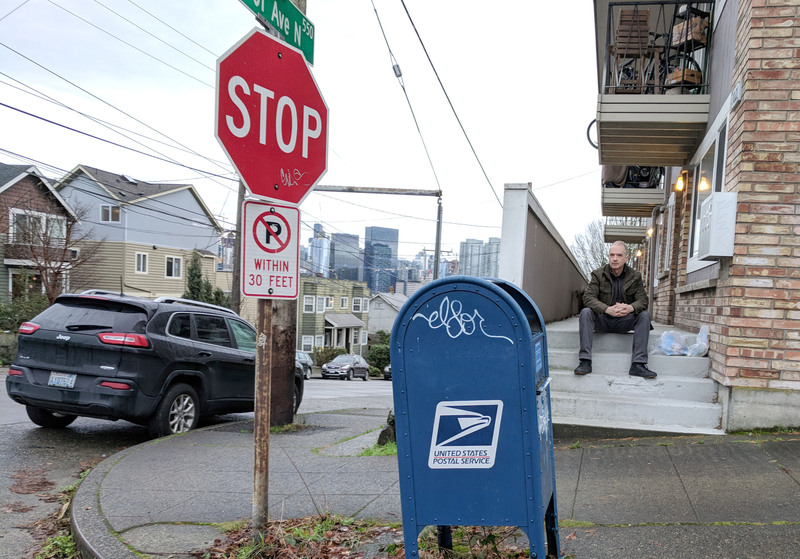 Tomorrow’s the big day, the very last mailbox photo! 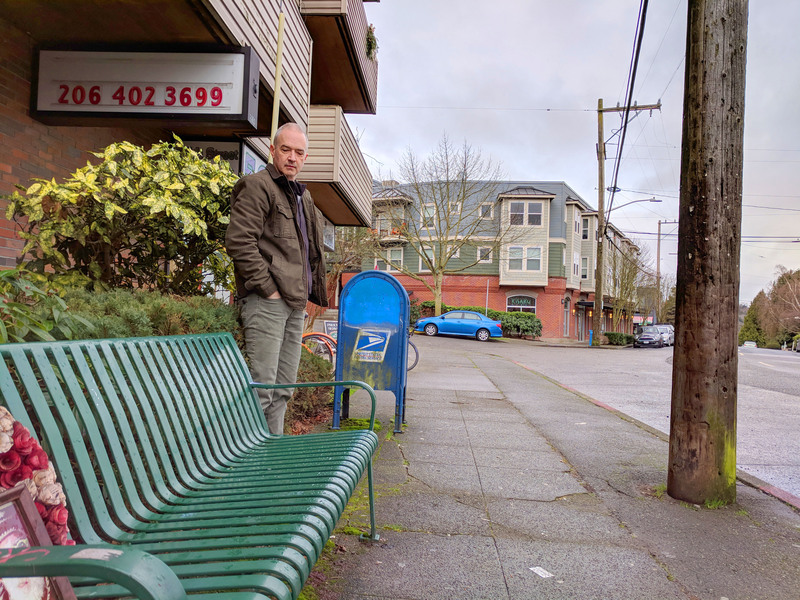 344) Faithful readers know that I love to enjoy the services of a good bench while out photographing mailboxes. On this day, however, I found this otherwise lovely bench to be a bit too rain-drenched for my taste. Meanwhile, it looks like I’m thinking really hard about a phone number. 343) I called this box the night before to remind it to get all cleaned up for its big photo shoot. But when I got there, I found that it done a rather lackluster job, and still had a prominent splash of graffiti on its head. He tried to get to get me to shoot from another angle, but I insisted on having the downtown skyline in the background. Turns out we’re both equally stubborn. I decided to have a sit and wait him out, but he held firm. It was like this for hours. 342) This photo really makes it look like the box and I are out on a stroll together. This is, of course, an absurd idea, because everyone knows that boxes walk alone. 340) This photo is a lie. A big fat lie. You’ve probably already spotted the problem. 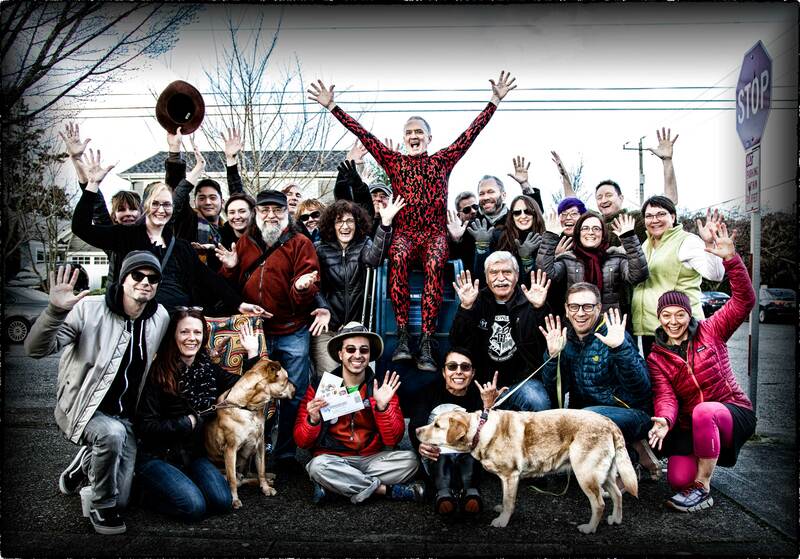 This photo is posted on February 5th, but there I am, supposedly trotting around downtown in shorts. True, there are many Seattleites who wear shorts year round, but Im not one of them. So whats up? Shortly after I took this photo in early September, I decided to save this box to be the final one in this project. 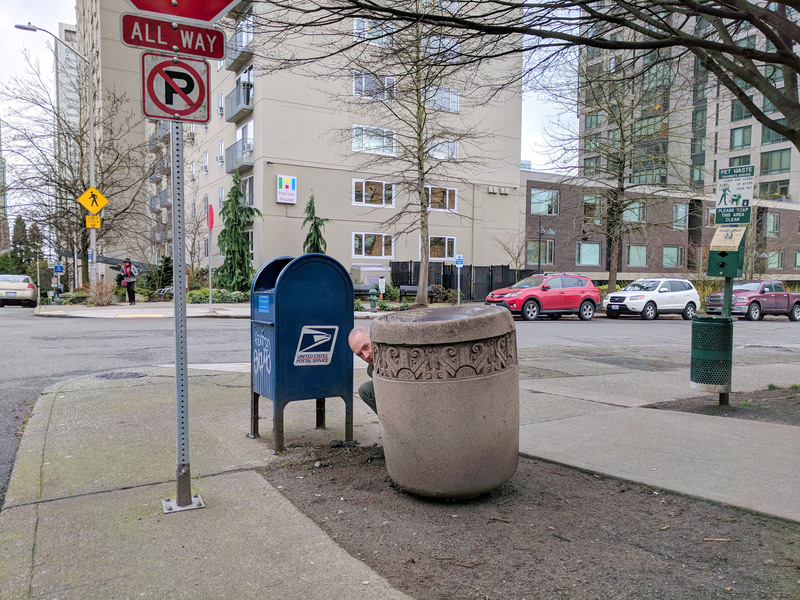 After all, its at the 98101 post office, so could there be anything more central to the whole mailboxes-of-Seattle theme than this? So, I cast this photo aside and planned to reshoot it at the end of the project. Well, faithful readers know that a new box as been chosen to conclude the project! And since I no longer have to save this 98101 box for that occasion, I was able to resurrect this photo to present to you today. Hows that for a riveting story? 339) If its true that a good photograph tells a story, this this must be a GREAT photograph. Just look at what’s going on. See that No Parking sign? Well, guess where I’m parked. Thats right, I’m parked right about where the camera is, which is clearly in no-no land. To escape detection, I decided to hide behind the fancy garbage can, because if the police cant see me, they can’t ticket me, right? But then, notice how the box is frantically dialing 911 to report me! What a snitch. Youll be happy to know I got out of there unscathed and unticketed. 338) You’ll notice I’m very distracted in this shot. First of all, I’m at Bigelow Ave N. I had no idea such a street existed! Bigelow! It is an absolutely lovely street with an awesome name and it has been hiding from me for over 30 years. I’m also distracted by that cool house in the background. This angle doesn’t really do it justice, so take my word for it that its really cool. The mailbox is nice, too. 337) I had a long discussion with this box about exactly which neighborhood he resides in. 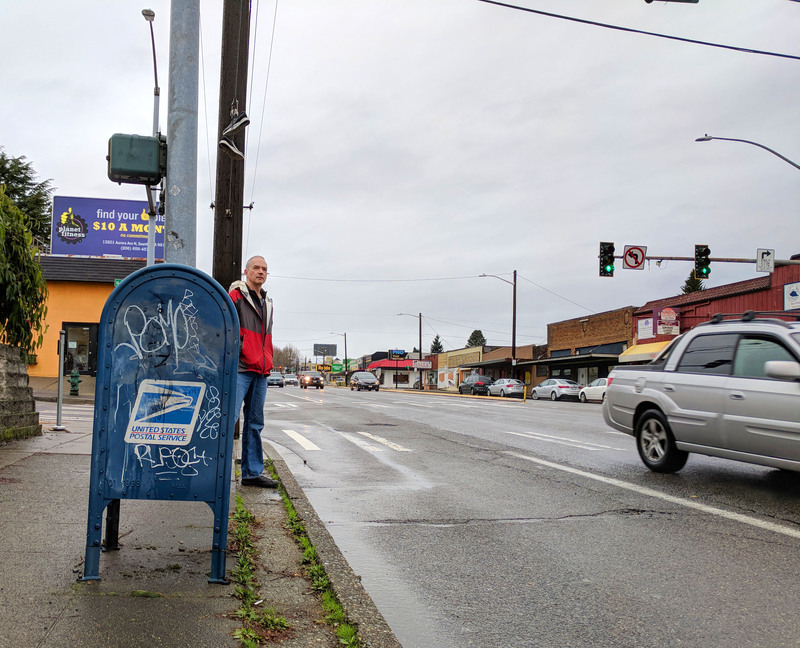 According to the official maps, this stretch of Aurora is the dividing line between Phinney Ridge (to the west) and Green Lake (to the east), meaning the box is clearly a Ridge Resident. The box, however, would hear none of that. 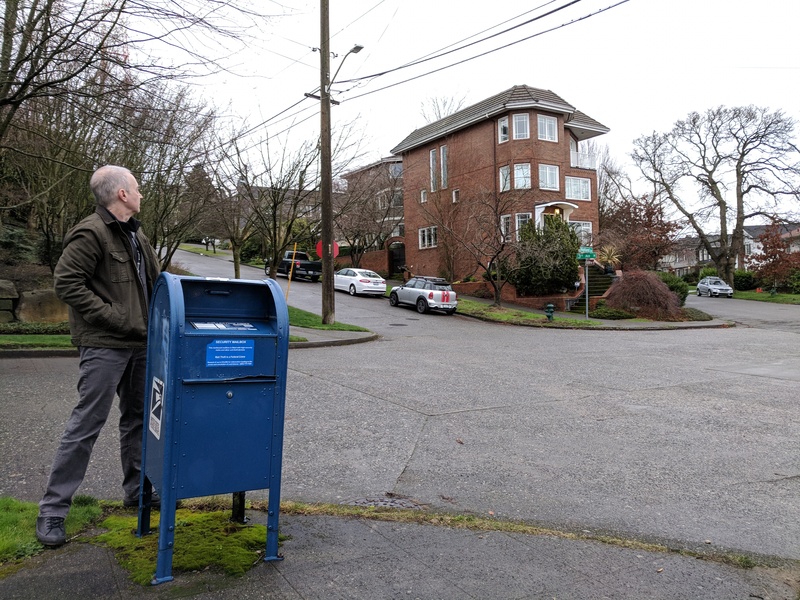 Despite several hours of explaining that the Ridge is an awesome neighborhood that he should be proud to call home, the box insisted on being considered a part of Green Lake. ”It’s the ducks,” he wailed. “I just love the ducks so very much.” I really can’t stand a blubbering mailbox, so Green Lake it is.